Nicole and Jay celebrated their simply sweet Chicago elopement at Creativo Loft, with a brief ceremony and portraits package we offer during weekdays. We set up our rustic wooden trunk ceremony altar with our vintage style decor, including antique aquamarine bottles, music sheet paper flowers, and real wildflowers. 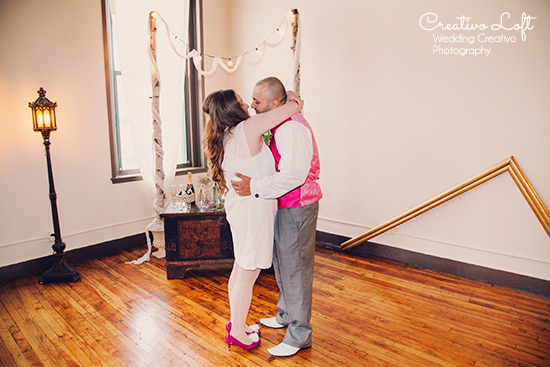 The couple added their own pop of color with fuchsia accents in their flowers and outfits. After the ceremony they celebrated with a champagne toast, and adorable cakepops from TipsyCake, which were decorated with "bride and groom" designs. Congratulations newlyweds!